What to eat? We should know, right? After all, about 75 percent of Americans say they eat healthy. In actuality, though, more than 80 percent of Americans fail to eat the recommended amounts of fruits and vegetables while over-eating refined grains and sugar. Add to that the plethora of chemicals and preservatives contained in the food we eat, among them ammonia and formaldehyde, and yikes – let’s start again. What to eat? Let the balancing act begin. My advice to my patients is nothing takes the place of clean eating. A well-balanced diet will help you maintain a healthy weight, feel better and ward off disease. With a little information about what and how much to eat, you will be on your way to a healthier future. The most up-to-date recommendations come from MyPlate, the USDA’s science-based dietary guide. The MyPlate model replaced the “food pyramid” in 2011 and applies to adults and children alike. It is taught in public schools and is one I share with my patients on a daily basis. 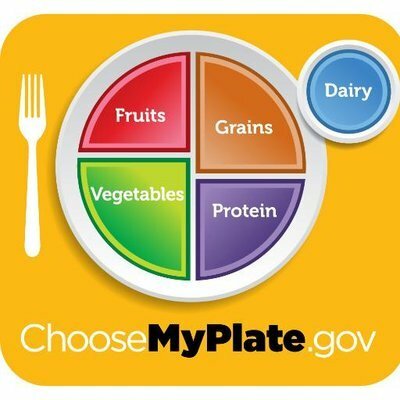 The official website, ChooseMyPlate.gov, provides guidelines, tips and a set of interactive tools in a fun and user-friendly way. The model calls for a daily allotment of healthy food that uses the image of a place setting as a visual to illustrate the guidelines for meal planning; 50 percent of your plate should contain fruits and vegetables, 25 percent grains, and 25 percent lean protein (beans, nuts, poultry, fish, eggs, seeds and lean meat). Recommendations are also made for dairy foods. What to do about so much food? Just as important as what to eat, is how much to eat. Portion control is essential. We Americans simply eat too much. I advise my patients that instead of counting carbs and proteins, which can be very cumbersome, focus on quality of food and serving size. Using the MyPlate model reinforces portion control and discourages overeating. Fruits and Vegetables: One serving basically amounts to the size of your fist; the average eater needs about four to five fistfuls, or servings, of fruits and vegetables per day. According to our plate, this should represent half of all daily food intake. See detailed lists of fruit and vegetable requirements and serving equivalencies. Proteins: Most of us eat enough protein, but need to make leaner selections. For ease in meal planning, use the simple estimation method described above; a small handful of nuts = one serving, but with eggs, meat, poultry or fish, visualize your daily allowance taking up 25 percent of your plate. If you have special dietary needs and must strictly count your protein intake, the scientific approach is to measure it in one-ounce equivalencies. See a detailed list of protein requirements and serving equivalencies. Grains: At least half of your grain intake should be whole grains, an area where most Americans fail. In general, one slice of bread, one cup of ready-to-eat cereal, or one-half cup of cooked rice or pasta is considered a serving. Again, visualize your serving taking up 25 percent of your plate. See a detailed list of grain requirements and serving equivalencies. Dairy: Two to three servings of milk or milk product are recommended, depending on age. In general, one cup of milk or yogurt, and one to two ounces of cheese are considered a serving. See a detailed list of dairy requirements and serving equivalencies. Use the 80/20 rule: eat healthy 80 percent of the time and reserve the other 20 percent for a little splurging. Have your scoop of ice cream once or twice a week, but keep it to just a scoop. Bored with your nutrition? Look at your plate. Make it colorful and add some variety. Don’t fall for fad diets. They’re expensive and unsustainable. Exercise is critical to wellness, but remember - it's easy to eat 500 calories, and really hard to burn 500 calories. Choose wisely! The MyPlate guidelines for youth are generally the same as for adults. Establishing good habits in childhood will set up your kids for long-term health as adults. For more good information, visit healthychildren.org. To have your child’s nutrition evaluated, call AdventHealth Primary Care – Prairie View Medical Building, at 913-789-1940. Please note: The above information is intended for use by MOST people in MOST cases. If you have a specific nutritional challenge, see your doctor for further discussion.